Just 10 years ago, your choice of wood stains might as well have been brown, brown or brown. But contemporary manufacturers now offer a wide array of colors, from ocean blue to forest green — even pumpkin orange. These hues are still inspired by Mother Nature. She just kicked them up a notch. And your choices don't end there. Modern technology has helped to produce safer, less-toxic stains — along with additives to make the formulations longer lasting and more protective. But which one is right for you? "There are no hard and fast rules," says Sjoerd Bos, owner of The Sansin Corporation in Strathroy, Ontario. "But there are upsides and downsides to every finish, so you should base your stain selection on your specific project." With manufacturers regularly refining and growing their product lines, you'll gain a lot by asking the pros which stains they suggest — and why. (Perhaps one penetrates more deeply, while another provides more UV protection.) But here are the basic options. Stains come in three formulations: oil-based, water-based, and "emulsions" that blend the two. For the most part, oil-based formulas are no longer used since equally effective, less-toxic options have come to market. However, a manufacturer may still recommend an oil-based formula for restaining an old log home if you don't know what formula was originally used. The primary difference between interior and exterior stains is the presence of additives. Because exterior walls are exposed to the elements, ingredients are often added for UV protection and to prevent fading. Others fight the growth of fungi, mold or mildew. Most interior walls don't need these additives, though UV protection may be a good idea in a sunroom or any space with lots of windows. If you don't think your walls react to sunlight, you've never taken down a photograph only to be shocked at how much darker the wall is behind it. On the other hand, stains without additives are less toxic and less expensive. So, again, it comes down to your project and preferences. Now for the fun part – choosing the actual color! While you want to select colors that reflect your personal style, choose carefully. All of our experts recommend going with hues you can live with for years to come. 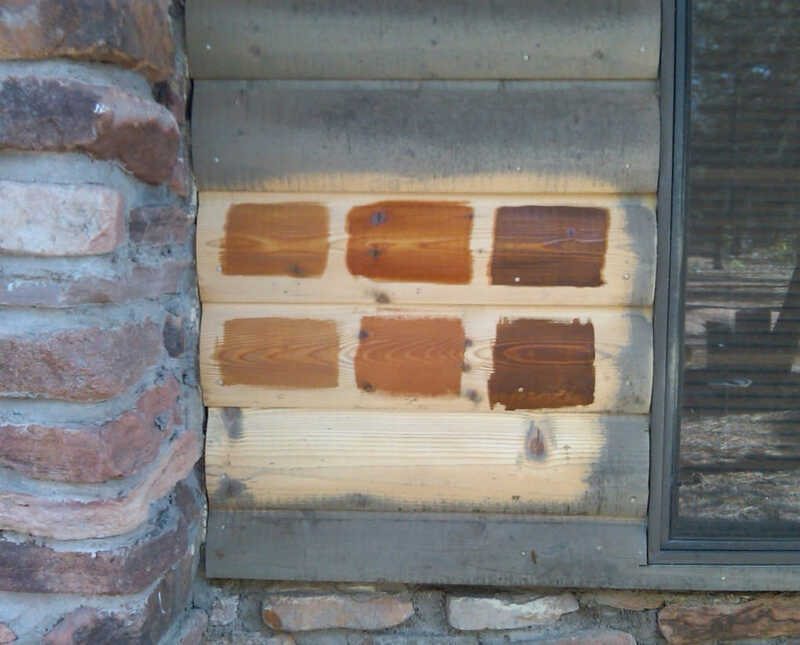 Changing colors on a stained log wall is not nearly as easy as repainting drywall or reapplying wallpaper. One of the most popular colors on the east coast is gray. Whether on the rocky New England shoreline or tucked into a woodsy area in the South, gray exteriors can give your home a weathered look, as though it's been part of the surrounding landscape for 100 years. Folks on the west coast seem to favor golden shades — perhaps inspired by the region's deserts, mountains and sunshine. Ten years ago, most home owners selected just two stains: a light color for the interior and a darker one for the exterior. But with all the hues available today, why not be adventurous with accent colors? On cottage style log homes, that gingerbread trim cries out for color. (Just think of the "painted ladies" of Victorian architecture.) Or maybe you want to go lighter, darker or just completely different with porch rails, shutters or decks. There's no rule that says you can only use one color on your log home's exterior. 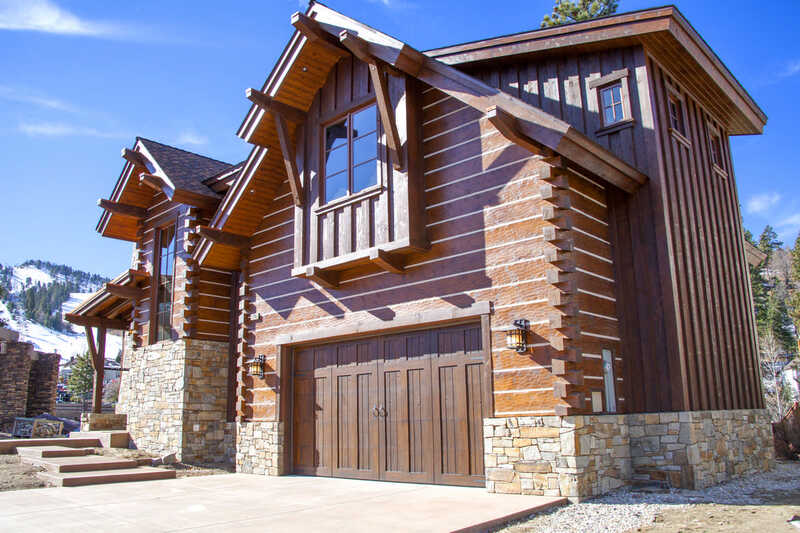 Opportunities for color abound inside log homes. For decorating flexibility, you may want to stick with something neutral for your primary log walls. But consider adding an accent color to highlight certain design details. Show off your lofty ceilings by staining the upright supports moss green. Make a statement in the kitchen by staining one wall rooster red. Add depth to built-in shelves with a bookish blue. Or sweeten up the guest room with a mix of antique white and pale pink. When it comes to style, anything goes. To ensure you get the exact shade you want, always test the stain first. "Various wood species take color differently," says Jim McCain, owner of Weatherall Company in Charlestown, Indiana. "Even different trees from the same species can yield different results." His advice: Only test wood from your own home. If you don't have cut-offs from the construction, try staining the inside of a closet. Be sure to stain a large sample to get a feel for how the color will look on an entire wall. During the test, use the same application technique you'll use for the "real" project. 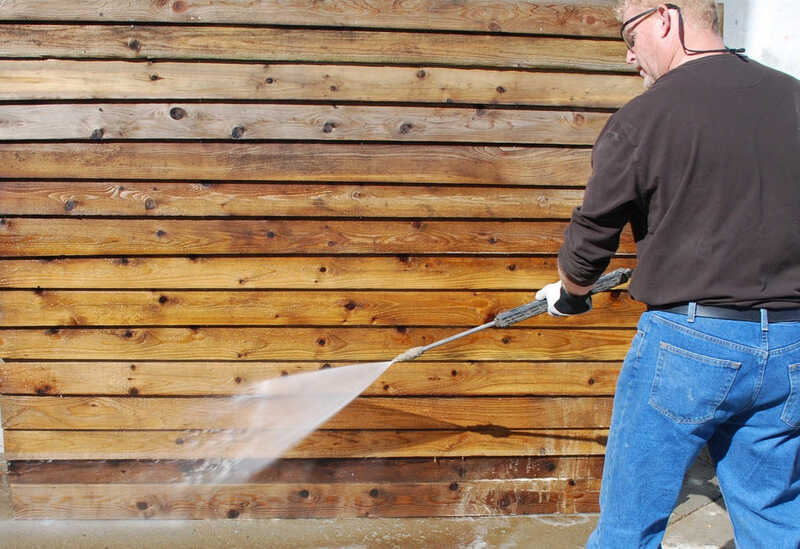 Stain applied with a brush will look slightly different than stain applied with a sprayer. If you're a novice, stick with the brush. "Brushing can help take out runs and overlap marks, says Jeff Kyger, sales and marketing representative for Perma-Chink Systems in Redmond, Washington. "But if you do use a sprayer, go over the coat with a brush to ensure good adhesion and even coverage." What if you don't like the sample hue? Choose a different product or different color of the same product. You can't alter the color of a stain you've already purchased. That's why the sample test is so important. If the romance of logs is enough for you, you may want to keep your home looking as natural as possible. But consider using some color, no matter how subtle. Naked log walls may look great, but they're more porous (and harder to clean) than logs with a glossy finish — especially in kitchens and bathrooms. For a happy medium, apply a clear topcoat. But remember: that palette isn't necessarily permanent. "The more transparent the stain, the more likely the end result can change," says Deb Bassett, Marketing Director of Sashco Inc. in Brighton, Colorado. "The aging process — and exposure to the elements — can shift a log's color to become little more yellow or gray." If that's a little too natural for you, consider a pigment that's close to your ideal natural wood finish. As a bonus, using a colored stain can increase UV protection, so log walls with pigmented color usually need less maintenance. Regular wood cleaning is the key to a long life for your wood stain. "Cleaning will prevent mildew from spreading and will keep dust and dirt from getting embedded," says Jeff. "A little maintenance now is cheaper and easier than a lot of maintenance five to seven years down the road." To keep your logs in top shape, simply wipe down interior walls with a damp cloth. To clean the exterior, use a hose or a power washer on a moderate setting. Pay special attention to the upper half of the logs. This area gathers more dust inside the home and is more exposed to the elements outside. There's no specific timetable for when your logs will need to be re-stained. The range can be anywhere from three years (for a heavily exposed outdoor wall) to 15+ years for an indoor wall that isn't exposed to direct sunlight. For a quick guesstimate, compare your most weather-beaten wall to your least-exposed wall. If the color difference is noticeable, it's time for a maintenance coat. "The degradation of a coating accelerates, so it's important to approach maintenance from a proactive rather than a reactive standpoint," says Sjoerd. Just keep your eye on the prize (i.e., that perfect shade of brown, green or blue) and take a few small, easy steps to keep your logs' beauty shining through.